We have had an incredibly mild winter. This has annoyed me for many reasons. The first reason is that when we prepared to move last summer, my youngest son, Patrick was aggravated that he was going to have to leave the saltwater pool that he loved so dearly. I, in all my wisdom, comforted him with stories of the snow we would get to play in since we were moving to a much northerly climate that has had snow every year for the last 160 years. So, we’re here, and of course, not…one…flake! In actuality we have only had three days of barely freezing temperatures. Is my eight year old scowling at me? I think he is. As for the garden. Because of this freakishly warm weather, I am now aching to be in the garden. C’mon it’s been sunny and seventy-two degrees for a week. So I am fighting the urge! I know I must fight it. For if I were to give in and plant something outside, those precious little seedlings would undoubtedly be clobbered by the long arm of the north. February and March will most likely now be unseasonably cold. So this is how I put my cravings in check. Seed catalogs help. As I said before, seeds started arriving at my house about the middle of December. 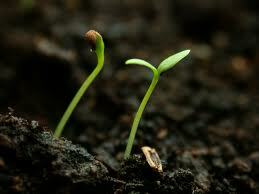 My middle son, Jonathan and I have been starting seedlings inside in preparation for this years garden. It helps to start some new seeds when I’m itching to get outside. Getting the structures ready has been helpful as well. Jonathan and I have also been making trellis’ and cages for the melons and cucumbers we’ll have this year. I have a plan for pvc towers to grow melons on that we are installing this week. I’ll post pictures when we get them erected. 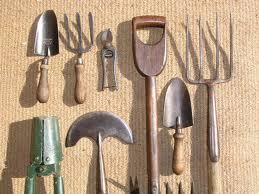 I’ve also sharpened my tools and oiled the wood. 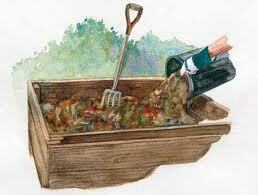 Finally, when I get really anxious about the wait, I work on my compost. I know that I’ll be needing plenty of that brown gold to feed my babies when spring actually does come calling. So, I water, and turn, and add horse poop to the compost pile. In the compost department, it has actually been beneficial to have had so many warm days. The lasagna compost beds have been settling down nicely. See Patrick, you’ve gotten to play outside more than usual for January and mommy’s compost is cooking faster. Still scowling. Sigh. I guess I’ll start some new seeds. Have a paisley day.